Why refer your passengers to consult one of TMA’s Travel Medicine Doctors? TMA Doctors have been providing travel medicine services to the passengers across Australia since 2005. Assist your travellers to access the right information and advice, and have a healthy journey (and book with you again). Help your passengers experience a more extensive personalised service than just booking a flight online and getting no extra information. Help avoid the possibility of litigation arising from giving your passengers inadequate or out of date advice on travel health issues. Ideally, travellers should seek medical advice at least 6- 8 weeks before travel. Vaccinations take time to take effect. However, it is never too late to plan for a healthy trip. You may care to suggest they look at our website for information about our service. We try to keep our prices as low as possible, however, our prices reflect the cost of delivering a high-quality travel medicine service to your passengers. The consultation fee is rebatable through medicare as long as the client is not travelling for work. Vaccinations can be claimed through ‘extras cover’ of private health funds. Ideally, consultants need a system to refer passengers for travel health advice in writing, so the consultant has documentation proving that health issues were covered. We wish you a healthy journey, so we recommend you consult a Travel Medicine specialist 6-8 weeks prior to departure – (Phone 1300 42 11 42) – to organise recommended health precautions for this trip. We also have information flyers that can be displayed in your office or routinely given to your passengers. Why not try our service for yourself and experience the great service that we give your travellers – at a special industry price. 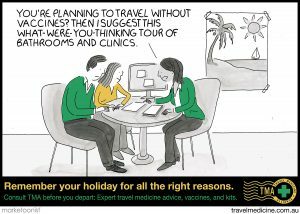 As a travel consultant, you know how important it is to get specific and up-to-date medical advice before setting off for exotic destinations. Many of our patients come to us because their consultant has recommended us. I invite you to visit your local provider, prior to your next overseas trip. Experience first hand, the thorough way we look after our patients to make sure they have a healthy trip. How much will this cost you? We don’t want to post our special trade discounts on an open website so email your local clinic and tell us where you work and we will send you all the information you need. You need to bring your business card to your consultation. Travel Consultants: Keeping passengers healthy from Dr Deb Mills on Vimeo. If you would like more information on how we can help you assist your passengers have a healthy journey just call your local clinic 1300 42 11 42. FInd your local TMA member here.